While the background and journey adds substance to the story, you barely need a fraction of the opening song from Nicole Atkins’ new album to know that you are in the midst of a winner. GOODNIGHT RHONDA LEE is the triumphant result of a calling ‘South’ and proof that the horizon knows no limits when all the stars are aligned. Natural talent is bestowed upon an individual with no invitation, but how it is utilised is key to transmitting such a gift from the creative individual to the person experiencing it. From its scintillating opening through the other ten tracks, this achingly beautiful album fans the vocal flames with extraordinary pedigree. A record that smoothly switches from making you smile, cry, think and dance, this a classic cut of country soul, which spans the generations. Throughout the album, Nicole wanders into soul territory armed with rock credentials, never really staying, yet intent on soaking up all the vibes that have formed the ‘Great American Soul Book’. Although the album was initially recorded in Fort Worth Texas by the same Niles City Sound team responsible for the recently acclaimed Leon Bridges recording, the release has been orchestrated by Single Locke Records: a burgeoning indie label operating right in the heart of the Shoals region in Florence Alabama. There is so much local flavour in the sound and a strikingly directional move for Nicole who had grown into the label ‘Queen of Asbury’ in her native New Jersey. Further delving into the background events that led to the making of this album help build the picture, but the overriding conclusion is that the decision to settle in Nashville has worked wonders on the recording front. There is going to be a tendency for a logical link to some of the soul giants, but I’m going to name three different associations that spill out of many plays of this gem. Stunning opener ‘A Little Crazy’ will accrue many plaudits with its power; even to the extent of sliding up the vocal range in a very Roy Orbison-style. However, there so much synergy to when Brandi Carlile cracks open her vocal chords and this will do quite nicely. Essentially Nicole pours every sinew of energy into this piece before digging deep into her versatility to ensure the remainder of the album retains its freshness. The second association that jumped out was in the acutely retro sounding title track. It doesn’t take too much online searching to find out that ‘Goodnight Rhonda Lee’ is a message to her fading alter ego demon. Nicole addresses this in a classic pop style and traces of the vocal performance are reminiscent of the fabulous Lindi Ortega injecting intense emotion into a song. You need to cross the Atlantic for the final link and how there is a hint of Amy Winehouse’s version of ‘Valerie’ in the soulful ‘Sleepwalking’. This is one of several tracks where Nicole and her bunch of players get the listener’s feet moving in a semi-rhythmic way including the horns-influenced soul stomping ‘Brokedown Luck’ and the sweet hook-adorned ‘Listen Up’. Of course, Nicole will herself no doubt pay tribute to the players assembled for the making of this record, of which the finishing touch was added by Ben Tanner of Alabama Shakes. Their influence constructed a sound track to supplement the vocal element, whilst ensuring the the overall feel sways between soul, rock and country. The latter is represented by slithers of faint steel especially in the aforementioned opener, the superbly poignant ‘A Dream Without Pain’ and the concluding number ‘A Night of Serious Drinking’, which rolls out as a tender laid back lounger mixing the minimal twang with some hazy sax. Elsewhere on the record, the theme hits a very personal note especially on ‘I Love Living Here (Even When I Don’t’), a thoughtful piece on her departure from Asbury Park. Further insight into the mind-set that fuelled this album comes from ‘Darkness Falls So Quiet’ complete with its rising tempo and theme of loneliness. Nicole really excels in piano ballad mode for the moving repenting piece ‘Colors’. A lovely restful mid-album song, which reinvigorates the listener to savour the second half. Perhaps the one song that lags a little behind the bulk of the collection is ‘If I Could’, but probably suffers as a result of its high standard contemporaries rather than any deficiencies. No doubt this album with be claimed by the Americana community especially with Nicole’s now Nashville residency and the doors that open in that city, which are far more wide reaching than the confines of Music Row. Ultimately, GOODNIGHT RHONDA LEE is an album that you will fall in love with. 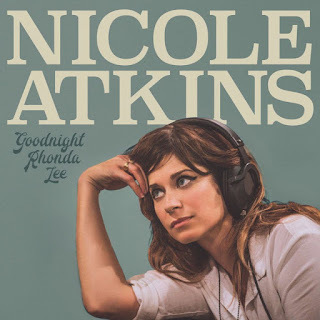 It can be interpreted as a career re-boot, while certainly possessing the class to ensure the music of Nicole Atkins is opened up to a whole new audience.